Tote bags are like the SUVs of the leather bag world. You can haul just about anything imaginable in a tote – and they’re made in every conceivable size, color, and style. If you use the Search feature for Waskerd here on the BestLeather website, you’ll discover that we’ve reviewed quite a few different pieces for Derek Shaw, owner of Waskerd. This is the second piece from Waskerd that I have received and, just like the Madison 3-Pocket Slim Wallet, the Small Tote Bag is an excellent example of high quality leather craftsmanship. The Waskerd Small Tote Bag is made from the same material as Derek’s other products – full grain leather. It’s hand cut and 100% hand-stitched using a durable, heavy gauge, polyester thread. The stitching is perfect (no surprise there) and is reinforced at stress points. The handles are split shank and attached to the bag with stitching and rivets. The Waskerd Small Tote Bag is available in three different leather colors too. As a registered nurse who works in home health, my wife spends a lot of time in her car traveling to various patient’s homes all over Kootenai County. And, she has to carry a lot of things with her. One of her frustrations is having a place to keep her own every day carry items handy and easily accessible. A purse isn’t always a good option. So, now she has the Waskerd Small Tote Bag in her vehicle and keeps her wallet, phone, a few snacks, pens, and a few various items in it. And, she’s very pleased. She can quickly grab what she needs, when she needs it. And, when she’s ready to take off again, everything goes back into the tote. One of the things she most appreciates about it is its stable design. It stays put and stands securely whether she places it on the floor or on the passenger seat. For her, it’s just the right size and serves a specific purpose perfectly. And, I suspect this is exactly why it was designed the way it is and at the size it is. The only drawback she’s noted is that the handles are a bit too short. She’d like for the tote to have longer handles so that it would easily slip over her hand and wrists in order to carry it, at times, on her arm instead of only having to grip the handles. The Waskerd Small Tote Bag looks great. As mentioned earlier, it’s expertly made. The stitching is impeccable. And, with all Waskerd products, it features the signature stitched logo on the front bottom right corner in white thread to match the thread around the trim of the tote. The handles have a matching black thread and if you look closely, each end of the strap is anchored to the bag and stitched with the same Waskerd logo pattern. It’s a simple model of a classic tote and sports one, single pocket. On the Waskerd site, it’s described as being perfect for commuters. I think it would also be an awesome lunch bag for anyone who enjoys packing their own lunch. And, you’d never have to worry about lunch sacks for the rest of your working career. 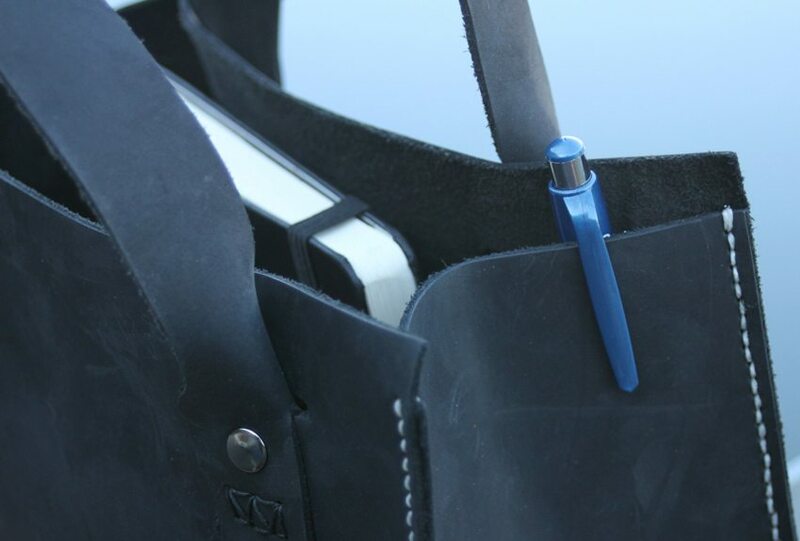 The Waskerd Small Tote Bag is an ingenious leather bag and definitely serves a niche purpose. Some may think that the $195 price tag is a bit much – considering you can find full size tote bags at the same price. But, it’s purpose built, expertly crafted, features incredible high quality components, made in the USA, and will last your entire life. When you take all of those things into consideration, the Waskerd Small Tote Bag qualifies as a BestLeather Buy It For Life piece. 3 Comments on "Waskerd Small Tote Bag Review – $195"